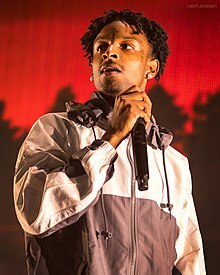 Shéyaa Bin Abraham-Joseph (born October 22, 1992), known professionally as 21 Savage, is a rapper, songwriter and record producer based in Atlanta, Georgia. He became known in Atlanta for the 2015 mixtape The Slaughter Tape before attaining nationwide attention following an extended play collaboration Savage Mode (2016) with the producer Metro Boomin and its lead singles "X" and "No Heart", as well as his guest feature on the 2016 Drake single "Sneakin'". 21 Savage released his debut studio album, Issa Album, on July 7, 2017. It debuted at number two on the Billboard 200 and gave him his first Billboard Hot 100 top 20 song, "Bank Account". His first number one single came at the end of 2017 with his feature on Post Malone's "Rockstar", which was nominated in two categories at the 61st Grammy Awards. On Halloween 2017, he released the Offset and Metro Boomin collaboration Without Warning. In December 2018, he released his sophomore album, I Am > I Was, which debuted at number one on the Billboard 200 and stayed at number one for two consecutive weeks. 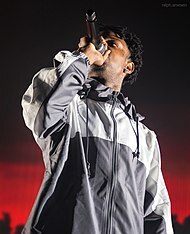 Shéyaa Bin Abraham-Joseph (born October 22, 1992), known professionally as 21 Savage, is a rapper, songwriter and record producer based in Atlanta, Georgia. He became known in Atlanta for the 2015 mixtape The Slaughter Tape before attaining nationwide attention following an extended play collaboration Savage Mode (2016) with the producer Metro Boomin and its lead singles "X" and "No Heart", as well as his guest feature on the 2016 Drake single "Sneakin'". 21 Savage released his debut studio album, Issa Album, on July 7, 2017. It debuted at number two on the Billboard 200 and gave him his first Billboard Hot 100 top 20 song, "Bank Account". His first number one single came at the end of 2017 with his feature on Post Malone's "Rockstar", which was nominated in two categories at the 61st Grammy Awards. On Halloween 2017, he released the Offset and Metro Boomin collaboration Without Warning. In December 2018, he released his sophomore album, I Am > I Was, which debuted at number one on the Billboard 200 and stayed at number one for two consecutive weeks. On February 3, 2019, Abraham-Joseph was arrested by the U.S. Immigration and Customs Enforcement (ICE), officials of which stated that he is a citizen of the United Kingdom who entered the U.S. in July 2005 and then unlawfully overstayed his visa when it expired in July 2006. He was granted bond on February 12 and released the next day, pending the outcome of an expedited deportation hearing scheduled for April 11. 21 Savage was born as Shéyaa Bin Abraham on October 22, 1992, at Newham Hospital in Plaistow, London, England, to British-born parents Heather Carmillia Joseph and Kevin Cornelius Emmons, who are of Dominican and Haitian extraction. His twin sisters, dance choreographers Kyra and Jayda Davis, and father continue to live in London, with Emmons working for Westminster City Council. Abraham-Joseph's grandmother lives in Brixton. Abraham-Joseph's parents separated early in his life, and he moved with his mother to Atlanta, Georgia, at the age of 7. In June 2005, at the age of 12, he went to the United Kingdom for the funeral of an uncle, stayed for a month and then returned to the United States on July 22, 2005, on an H-4 visa, which allegedly expired a year later (and Abraham-Joseph's attorneys have acknowledged that he and his family overstayed their visas). Abraham-Joseph's mother then began a relationship with Dr. Amsu Anpu, an endocrinologist and British expatriate, with whom she had more children. He had a brother Quantivayus ("Tay-Man") who died in a shooting after an attempted drug deal. In the seventh grade, Abraham-Joseph was banned permanently from every school in DeKalb County School District for gun possession. This led him to begin attending schools around the Atlanta metropolitan area before being sent to a youth detention center. After being released from the youth detention center, he completed eighth grade through an alternative program before finishing a semester of high school; he dropped out in his freshman year following multiple exclusions that he said "exhausted" him. After dropping out, Abraham-Joseph joined a local street gang affiliated with the wider Bloods street gang and became a full-time drug dealer, mainly selling cannabis. He also regularly took part in other criminal activities including robbery and car theft, although he was only arrested once after contraband was found in a car he was driving. In 2011, when Abraham-Joseph was 19, he lost his "right hand" man, Larry, in a shootout. In 2013, during an attempted robbery on his 21st birthday, Abraham-Joseph was shot six times by rival gang members and his best friend Johnny was killed. Following the death of his friend in a shootout on his 21st birthday, Abraham-Joseph began rapping. His music career was originally subsidized by his deceased friend's uncle, who gave him money for studio time in 2013. On November 12, 2014, 21 Savage's debut single, "Picky", produced by DJ Plugg, was released. It was later included on his debut mixtape, The Slaughter Tape, which was released on May 25, 2015. The release made him what Interview Magazine called an "underground hero in Atlanta". On July 2, 2015, 21 Savage released a collaborative EP, Free Guwop, with Sonny Digital. It is a tribute EP to fellow rapper and influence Gucci Mane. On December 1, 2015, 21 Savage released his second mixtape, Slaughter King. In June 2016, 21 Savage was named as one of the "Freshman Class" of 2016 by XXL. On July 15, 2016, 21 Savage released his joint EP Savage Mode with Atlanta-based record producer Metro Boomin. The EP gained international success and peaked at number 23 on the Billboard 200, which became their highest charting EP to date. He was on the cover of Fader. His single "X" featuring Future on the EP was confirmed by Billboard as going platinum in the US, being 21's 1st platinum record. On January 18, 2017, 21 Savage announced that he had signed to Epic Records. In 2017, his debut studio album, Issa Album, debuted at number two on the US Billboard 200. Its lead single, "Bank Account", peaked at number 12 on the Billboard Hot 100. Later that year, he was featured on Post Malone's single "Rockstar", which peaked at number one on the Billboard Hot 100 and broke numerous records. It's 21 Savage's first number 1 song. On October 31, 2017, a collaborative studio album by 21 Savage, Offset, and Metro Boomin named Without Warning was released. Without Warning debuted at number four on the US Billboard 200 and received generally positive reviews from critics. Its lead single, "Ric Flair Drip" peaked at number 13 on the Billboard Hot 100. In April 2018, 21 Savage had a guest appearance on Young Thug's extended play Hear No Evil along with fellow rappers Nicki Minaj and Lil Uzi Vert. Later that month, he also appeared on the single "Outstanding" by SahBabii. On March 21, 2018, he was featured on the single "Rover 2.0", which is part of BlocBoy JB's Simi mixtape. In the following month, he was featured on Ty Dolla Sign's "Clout", which was part of the deluxe edition of his album Beach House 3. On October 31, 2018, 21 Savage posted on his Instagram a picture of a man in silhouette jumping in the air in the direction away from a large blaze. In the bottom right corner of the picture there is a "Parental Advisory" notice, as there oftentimes is on the cover of rap releases. 21 Savage also tagged Metro Boomin in the post. For these reasons, some speculated it to be a sequel to 2017's Without Warning album. However, it turned out to be the cover for Metro's debut solo album, Not All Heroes Wear Capes. On December 6, 2018, 21 Savage posted cover art for upcoming album, I Am > I Was, on Instagram, which features a blurred out image of himself, captioning the image with a number of goat emojis. The next day, 21 Savage took to Twitter and his Instagram story to apologize that he "forgot" to release the album, saying on Twitter: "Dam I forgot to drop my album my bad y'all". He announced a new date of December 21, 2018. The track-list was leaked by record producer Louis Bell via his Instagram story on December 13, 2018. 21 Savage released his sophomore studio album I Am > I Was on December 21, 2018, with features from Travis Scott, Post Malone, Childish Gambino, Offset, J. Cole, Gunna, Lil Baby, Project Pat, and Schoolboy Q. None of those acts, however, are credited as artists on the album. I Am > I Was debuted at number one on the US Billboard 200 earning 131,000 album-equivalent units (including 18,000 pure album sales), making it 21 Savage's first U.S number one album. It was led by "A Lot", featuring vocals from J. Cole. It peaked at number 12 on the US Billboard 100. Called "one of the last street niggas left making music" by frequent collaborator Metro Boomin, 21 Savage's music is heavily autobiographic with an emphasis on violent and criminal aspects of his past, including murder and drug dealing. In 2018, 21 Savage reportedly started a movement called "Guns Down, Paintballs Up" which was intended to reduce gun violence by suggesting the use of paintball guns instead of lethal firarms. The head of the Detroit Police Department, James Craig, described the movement as "well-intentioned, however, misguided", after several incidents involving paintball guns later resulted in injuries, disorderly conduct involving large groups of people with paintball guns, property vandalism (e.g., of police vehicles), violent reprisals, and the mistaking of paintball guns for firearms. The movement has been linked to several cases of property crime and homicide. 21 Savage has not commented on the matter, although he paid for the funeral of a 3-year-old who was killed in a related incident. Controversy arose after Abraham-Joseph pulled out a firearm during a pool party on June 11, 2018. Abraham-Joseph had been given the firearm by a friend after seeing an opposing crew member also pull out a pistol. "ASMR", a song from 21 Savage's sophomore studio album I Am > I Was, caused some controversy with its lyrics. The lyrics included "We been gettin' that Jewish money, everything is kosher." The lyrics came under fire for perpetuating negative Jewish stereotypes when LeBron James shared an Instagram story quoting "ASMR". Abraham-Joseph later apologized, saying on Twitter that "The Jewish people I know are very wise with there [sic] money so that's why I said we been gettin' Jewish money. I never thought anyone would take offense, I'm sorry if I offended everybody, never my intention – I love all people." Abraham-Joseph practices the traditional African religion Ifá along with his mother. In the summer of 2017, Savage started dating model Amber Rose. As of May 2018, the couple had separated. He has three children; two sons and one daughter. He rarely talks about them, but had posted pictures of them on his Instagram. Abraham-Joseph was convicted of felony drug charges in October 2014 in Fulton County, Georgia. On February 3, 2019, Abraham-Joseph was taken into custody by the U.S. Immigration and Customs Enforcement (ICE) after a vehicle was pulled over that contained him and his cousin, the rapper known as Young Nudy, and two other men. Young Nudy and the two other men had been targeted in an operation involving charges of aggravated assault and violation of the Georgia Gang Act. Abraham-Joseph later alleged that he was personally also targeted in the operation. After his arrest, ICE revealed that Abraham-Joseph is a British national who has been in the United States unlawfully since his non-immigrant visa expired in July 2006. Before this, Abraham-Joseph had commonly been believed to be a native of the Atlanta area – e.g., Interview magazine had reported in an interview with Seth Rogen in April 2018 that the rapper's birthplace was Atlanta, Georgia, and in a 2016 interview with XXL Magazine, he said he was "from Decatur, Georgia" (which is in the Atlanta metropolitan area). A spokesperson for ICE said of Abraham-Joseph, "His whole public persona is false. He actually came to the U.S. from the U.K. as a teen and overstayed his visa." A birth certificate then surfaced showing that Abraham-Joseph was born in Newham, London, on October 22, 1992. This indicates that he had been 12 years old in July 2005 – not "a teen" (and he had also been in the U.S. from the age of 7 until his one-month departure in 2005). His attorney acknowledged that Abraham-Joseph had overstayed the expired visa, but said that he had not attempted to hide his background, and said that the Department of Homeland Security had been aware that in 2017 he had applied for a U visa – a type of non-immigrant visa offered to crime victims and their family members who are willing to assist law enforcement officials in the investigation or prosecution of the criminal activity. On February 15, 2019, Abraham-Joseph turned himself in to authorities and was booked into a south Georgia jail in response to a warrant for his arrest for felony theft by deception. This dispute surrounds a gig arranged in 2016 for which the rapper allegedly accepted a payment of $17,000 to appear at a concert, but did not appear and did not give back the money. He was released on his own recognizance, pending a court hearing on a later date to resolve the charge. In March 2018, Abraham-Joseph announced the creation of the 21 Savage Bank Account Campaign (named after his hit song "Bank Account") on The Ellen DeGeneres Show, he also announced that he was donating $21,000 to the cause. Abraham-Joseph said "I started the 21 Savage Bank Account Campaign and its to help kids learn how to save money and make money, and open bank accounts for kids." In early August of 2016, 2017, and 2018, Abraham-Joseph hosted the "Issa Back to School Drive" (named after his album Issa Album) in his home neighborhood in Atlanta, Georgia. The drive gave free haircuts, hairstyles, supplies, and school uniforms. In July 2018, Abraham-Joseph donated $10,000 to Atlanta's Continental Colony Elementary School to fund an anti-bullying campaign. In 2017, it was reported that 21 Savage was working on his debut film, Issa Movie. 21 Savage has also worked on a YouTube animated mini-series named Year 2100. 1 2 Wills, Ella (February 4, 2019). "Atlanta rapper 21 Savage was born in east London, birth certificate reveals, after US immigration officials arrest him over 'expired visa'". Evening Standard. Retrieved February 4, 2019. ↑ Pementel, Michael (December 26, 2018). "21 Savage Shines When He Gets Deep on I Am > I Was". Consequence of Sound. Retrieved February 11, 2019. ↑ Leight, Elias; Leight, Elias (July 26, 2017). "21 Savage: Rising Star Talks Honesty, Politics and 'Mumble Rap'". ↑ "ICE arrests rapper 21 Savage, says he's actually from UK". WSBTV. Retrieved February 3, 2019. U.S. Immigration and Customs Enforcement (ICE) arrested unlawfully present United Kingdom national Sha Yaa Bin Abraham-Joseph AKA "21 Savage" during a targeted operation with federal and local law enforcement partners early Sunday in metro Atlanta. 1 2 3 4 "21 Savage chops it up with Seth Rogen". Interview Magazine. April 26, 2018. Retrieved July 10, 2018. ↑ C.M., Emmanuel (October 9, 2015). "The Break Presents: 21 Savage". XXL Magazine. Retrieved May 2, 2018. ↑ "21 Savage". Grammy Awards (official website). December 5, 2018. Retrieved February 3, 2019. 1 2 "Post Malone's Rockstar Hits No. 1 on Billboard Hot 100 Chart". XXL Magazine. Retrieved May 2, 2018. ↑ Caulfield, Keith (January 6, 2019). "21 Savage Spends Second Week at No. 1 on Billboard 200 Albums Chart With 'I Am > I Was'". Billboard. Retrieved January 9, 2019. 1 2 Levenson, Eric; Valencia, Nick (February 3, 2019). "ICE arrests rapper 21 Savage, says he's illegally present in US". CNN. Retrieved February 3, 2019. ↑ Valencia, Nick; Levenson, Eric (February 13, 2019). "Rapper 21 Savage will be released from ICE detention on Wednesday". CNN. Retrieved February 13, 2019. ↑ "21 Savage, American Rapper". The New York Times. February 6, 2019. Retrieved February 7, 2019. His mother's family hails from Dominica, a former British colony in the West Indies. ↑ Abraham-Joseph, Shéyaa (November 3, 2016). "21 Savage Breaks Down the Lyrics to 'No Heart'". Rap Genius. Retrieved February 7, 2019. Yeah, my folks Haitian. Like, I'm Haitian. You know what I'm saying. My granddaddy Haitian. ↑ "21 Savage 'just a London softie' who 'faked' gun-toting gangster rap life in America, pals reveal". The Sun. February 4, 2019. Retrieved February 7, 2019. 1 2 3 Zaru, Deena; Ghebremedhin, Sabina (February 15, 2019). "21 Savage describes fears of deportation, says he was 'definitely targeted' by ICE in first interview since his release on bond". ABC News. Retrieved February 15, 2019. ↑ Capelouto, J. D. (February 5, 2019). "Breaking: ICE arrests rapper 21 Savage, says he is actually British and overstayed visa". The Atlanta Journal-Constitution. Retrieved February 21, 2019. ↑ "21 Savage Birth Certificate Reveals He Was Born in the U.K." Rap-Up. February 4, 2019. Retrieved February 4, 2019. ↑ Renshaw, David (February 15, 2019). "21 Savage says his lawyers believe he was targeted by ICE for rapping about immigration control". The Fader. Retrieved February 16, 2019. ↑ Brett, Jennifer (February 5, 2019). "21 Savage's lawyers say ICE 'provided incorrect information'". The Atlanta Journal-Constitution. Retrieved February 10, 2019. 1 2 Ortiz, Erik (February 15, 2019). "Rapper 21 Savage describes arrest by ICE: 'We got Savage'". NBC News. Retrieved February 21, 2019. 1 2 Silva, Daniella (February 4, 2019). "21 Savage 'never hid his immigration status', lawyer says". NBC News. Retrieved February 6, 2019. ↑ "21 Savage's Rumored Father, Dr. Amsu Anpu, Gains Attention Amid ICE Arrest". Hot New Hip Hop. February 4, 2019. Retrieved February 7, 2019. ↑ James, Andy (November 22, 2018). "The Brutal Story Behind 21 Savage's Dagger Face Tattoo". DJBooth. Retrieved May 2, 2018. ↑ Charlamagne tha God, DJ Envy (August 4, 2016). 21 Savage Interview With The Breakfast Club (Video). New York City: The Breakfast Club (radio show). Retrieved May 6, 2018. ↑ "Everything You Need To Know About 21 Savage". HotNewHipHop. Retrieved August 24, 2017. 1 2 3 Darville, Jordan (August 4, 2016). "21 Savage Talks Being An "A" Student, Losing His Best Friends On The Breakfast Club". The Fader. Retrieved July 10, 2018. 1 2 3 Hine, Samuel (June 27, 2018). "21 Savage: From Robbin' Season to Role Model". GQ. Retrieved July 10, 2018. ↑ Russell, Alex (October 1, 2015). "Meet 21 Savage, Atlanta's Most Respected New Rapper". The Fader. Retrieved August 24, 2017. ↑ "19 Facts You Need To Know About 'Rockstar' Rapper 21 Savage". Capital XTRA. Retrieved July 10, 2018. ↑ "21 Savage - The Slaughter Tape". LiveMixtapes. Retrieved April 27, 2016. ↑ "21 Savage - Free Guwop EP". LiveMixtapes. Retrieved April 27, 2016. ↑ Lilah, Rose (December 2, 2015). "21 Savage – Slaughter King – Download & Listen [New Mixtape]". HotNewHipHop. Retrieved April 27, 2016. ↑ "XXL Freshman Class Cover 2016". XXL Magazine. Townsquare Media. June 13, 2016. Retrieved May 6, 2018. ↑ "21 Savage – Chart History: Billboard 200". Billboard. Prometheus Global Media. Retrieved July 29, 2016. ↑ Lilah, Rose. "21 Savage on the cover of Fader". Retrieved November 23, 2016. ↑ Weinstein, Max (November 22, 2016). "21 Savage Gets His First Platinum Record With "X"". Retrieved December 3, 2016. ↑ "21 Savage Inks Record Deal With Epic Records". Retrieved January 18, 2017. ↑ "Top 200 Albums | Billboard 200 Chart - The Week of July 29, 2017". Billboard. Retrieved January 2, 2019. ↑ Caulfield, Keith (July 16, 2017). "21 Savage & Haim Debut in Top 10 on Billboard 200 Albums Chart". Billboard. Retrieved July 17, 2017. ↑ "Top 100 Songs | Billboard Hot 100 Chart - The Week of August 26, 2017". Billboard. Retrieved January 2, 2019. ↑ "Hot 100: Niall Horan's "Slow Hands" Enters Top 15, 21 Savage's 'Bank Account' Top 20". Headline Planet. August 7, 2017. Retrieved August 9, 2017. ↑ "21 Savage Chart History". Billboard. Retrieved January 2, 2019. ↑ "Post Malone Breaks Spotify Global Record With Rockstar". XXL Magazine. Townsquare Media. Retrieved February 16, 2018. ↑ "Post Malone & 21 Savage's 'Rockstar' Is Now Certified Platinum". Billboard. Retrieved February 16, 2018. ↑ "Top 200 Albums | Billboard 200 Chart – The Week of November 18, 2017". Billboard. Retrieved December 31, 2018. ↑ "Top 100 Songs | Billboard Hot 100 Chart – The Week of March 31, 2018". Billboard. Retrieved January 2, 2019. ↑ "Metro Boomin Chart History". Billboard. Retrieved December 31, 2018. ↑ Maicki, Salvatore (April 13, 2018). "Young Thug drops Hear No Evil EP". The Fader. Retrieved May 6, 2018. ↑ India, Lindsey (April 20, 2018). "Listen to SahBabii and 21 Savage's New Song "Outstanding"". XXL Magazine. Townsquare Media. Retrieved May 2, 2018. ↑ Breihan, Tom (March 23, 2018). "BlocBoy JB – "Rover 2.0" (Feat. 21 Savage)". Stereogum. Eldridge Industries. Retrieved May 1, 2018. ↑ Coleman II, C. Vernon (May 4, 2018). "BlocBoy JB Drops 'Simi' Mixtape Featuring Drake, Lil Pump and More". XXL Magazine. Townsquare Media. Retrieved May 9, 2018. ↑ Darville, Jordan (May 9, 2018). "Ty Dolla $ign recruits 21 Savage for 'Clout'". The Fader. New York City. Retrieved May 11, 2018. ↑ "Saint Laurent Don on Instagram: "y'all know what season it is @metroboomin 4L"". Instagram. Retrieved November 1, 2018. ↑ Haffenden, Dayna. "21 Savage Unveils Title and Cover Art for New Album - XXL". XXL Mag. Retrieved December 31, 2018. ↑ Don, Saint Laurent (December 6, 2018). "Dam I forgot to drop my album my bad y'all". @21savage. Retrieved December 31, 2018. ↑ Maiki, Salvatore (December 7, 2018). "21 Savage says new album I Am > I Was will drop December 21". The Fader. Retrieved December 31, 2018. ↑ Walker, Joe. "21 Savage Taps J. Cole, Childish Gambino, ScHoolboy Q, More for 'I AM > I WAS' Tracklist". OnSMASH. Retrieved December 31, 2018. ↑ "21 Savage Producer Shares Alleged "I AM > I Was" Features: J. Cole & More". HotNewHipHop. Retrieved January 2, 2019. ↑ Walker, Joe. "21 Savage Taps J. Cole, Childish Gambino, ScHoolboy Q, More for 'I AM > I WAS' Tracklist". OnSMASH. Retrieved January 2, 2019. ↑ http://hiphopdx.com, HipHopDX- (December 20, 2018). "21 Savage Drops "I Am > I Was" Album". HipHopDX. Retrieved January 2, 2019. ↑ "21 Savage's 'I Am > I Was' Album Debuts at No. 1 on Billboard 200 Chart". Billboard. Retrieved December 31, 2018. ↑ "21 Savage Debuts At No. 1 With "I Am > I Was"". HotNewHipHop. Retrieved December 31, 2018. ↑ "21 Savage – "A Lot" Chart History". Billboard. Retrieved January 2, 2019. ↑ "Meet 21 Savage, Atlanta's Most Respected New Rapper". The Fader. Retrieved July 10, 2018. 1 2 3 Diaz, Adriana (May 1, 2018). "'Paintball wars', initially intended to curb gun violence, linked to 2 deaths". CBS News. Retrieved May 2, 2018. ↑ "Detroit police cracks down on citywide 'paintball wars'". CBS News. April 21, 2018. Retrieved May 2, 2018. ↑ Patterson, Brandon; Zaniewski, Ann (April 27, 2018). "Detroit police to crack down on citywide 'paintball wars'". USA Today. Gannett Company. Retrieved May 2, 2018. 1 2 Mensch, Jessica; Luthern, Ashley (May 1, 2018). "Paintball shootings splatter cities after rapper calls for swapping handguns for paintball weapons". USA Today. Gannett Company. Retrieved May 2, 2018. ↑ "21 Savage Draws Gun During Atlanta Pool Party Brawl". Billboard. Retrieved July 10, 2018. ↑ "21 Savage Pulls Out A Gun During A Brawl: Watch". Vibe. June 10, 2018. Retrieved July 10, 2018. ↑ "21 Savage Apologizes for "Jewish Money" Lyrics". Pitchfork. Retrieved January 2, 2019. ↑ Don, Saint Laurent (December 24, 2018). "The Jewish people I know are very wise with there money so that's why I said we been gettin Jewish money I never thought anyone would take offense I'm sorry if I offended everybody never my intention I love all people". @21savage. Retrieved January 2, 2019. ↑ Witmer, Phil (August 4, 2016). "No Joke, You Should Definitely Watch 21 Savage's Entire 'Breakfast Club' Interview". Noisey. Vice Media. Retrieved May 6, 2018. ↑ Barshad, Amos (November 21, 2016). "Savage World". The Fader. Retrieved May 6, 2018. ↑ Tayo, Ayomide O. "21 Savage, the hottest rapper in America worships Ifa". Retrieved May 6, 2018. ↑ Coleman II, C. Vernon (February 10, 2018). "Amber Rose Sniffs 21 Savage's Underwear When She Misses Him". XXL Magazine. Townsquare Media. Retrieved February 10, 2018. ↑ "21 Savage Got The Sexiest Gift From Amber Rose For Valentine's Day". BET. February 14, 2018. Retrieved March 16, 2018. ↑ Mizoguchi, Karen; Rubenstein, Janine (March 14, 2018). "Amber Rose and 21 Savage Split After Nearly 2 Years of Dating". People. Retrieved March 15, 2018. ↑ "Does 21 Savage have any kids?". Capital XTRA. Retrieved May 6, 2018. ↑ "Grammy-Nominated Rapper 21 Savage in US Immigration Custody". NBC 10 Boston. February 3, 2019. Retrieved February 16, 2019 – via Associated Press. 1 2 Strauss, Matthew (February 4, 2019). "21 Savage's ICE Detention Allegedly Instigated by the Arrest of His Cousin Young Nudy". Pitchfork. Retrieved February 16, 2019. ↑ Andrews, Travis (February 3, 2019). "Rapper 21 Savage arrested by ICE agents, who say he's from the United Kingdom, not Atlanta". Washington Post. Retrieved February 4, 2019. ↑ Dowd, Katie (February 3, 2019). "Rapper 21 Savage arrested by ICE, which alleges he is actually British". San Francisco Chronicle. AP. ↑ Kreps, Daniel (February 3, 2019). "ICE Apprehends 21 Savage, Claims Rapper Is British and Overstayed Visa". Rolling Stone. Retrieved February 3, 2019. ↑ Davies, Gareth (2019-02-04). "21 Savage, Grammy-nominated rapper who told of his tough upbringing in Atlanta, is actually British". The Telegraph. ISSN 0307-1235. Retrieved February 4, 2019. ↑ Redmon, Jeremy (February 15, 2019). "Atlanta rapper 21 Savage booked into S. Georgia jail on felony warrant". Atlanta Journal-Constitution. Retrieved February 15, 2019. ↑ Centeno, Tony M. (February 15, 2019). "21 Savage Surrenders to Authorities on Felony Theft Warrant". XXL Magazine. Retrieved February 15, 2019. ↑ Goodwin II, Bruce. "The Give Back: 21 Savage Announces his Charitable Efforts on the Ellen Show". cassiuslife.com. Cassius. Retrieved January 25, 2019. ↑ Wallace, Riley. "21 Savage Hosting Back to School Charity Event". hiphopdx.com. Hip Hop DX. Retrieved January 25, 2019. ↑ "21 Savage Delivers Trailer for ISSA Movie". BallerStatus.com. December 10, 2017. Retrieved November 4, 2018. ↑ "21 Savage Gets Animated in New Web Series 'The Year 2100'". XXL Mag. Retrieved November 4, 2018. ↑ "Here Is the Complete List of BET Awards 2017 Winners". Billboard. Retrieved January 3, 2019. ↑ "7th Annual Nominees". The Streamy Awards. Retrieved January 8, 2019. ↑ Atkinson, Katie (March 11, 2018). "iHeartRadio Music Award Winners 2018: Complete List". Billboard. Retrieved March 11, 2018. ↑ "Billboard Music Awards 2018 Nominations: See the Full List". Billboard. April 17, 2018. Retrieved April 17, 2018. ↑ "2018 American Music Awards Winners: The Complete List | The American Music Awards". ABC. Retrieved January 2, 2019. ↑ "MTV VMAs 2018 Complete Winners List". Billboard. Retrieved January 2, 2019. ↑ "(EXCLUSIVE) Here's The Complete List Of BET Awards Winners". BET.com. Retrieved January 2, 2019. ↑ "Here Are All the Winners From the 2018 BET Hip Hop Awards". Billboard. Retrieved January 2, 2019. ↑ "61st Grammy Awards: Full Nominees List". Grammy.com. 2018-12-07. Retrieved January 2, 2019.